Indications: It is used in the treatment of breathlessness due to chronic bronchitis, asthma, chest congestion, tuberculosis. 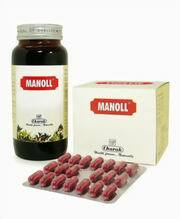 Also helpful in treating urinary disorders, cough, cold, diabetes, anaemia, skin diseases, infertility and hairfall. 125 mg – 250 mg to be taken twice a day with honey or water. Usefull in Viryavikar, Yonivikar, infertility. Invigorates organs and strength. For external use only. Apply 5-10 drops on the affected part with gentle massage.